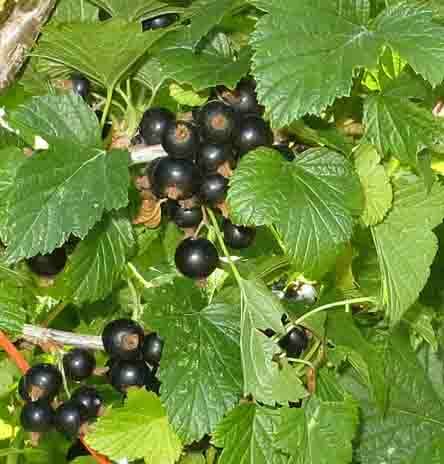 Black currants prefer damp fertile soils and are widely cultivated both commercially and domestically. On sandy soil they should be mulched and watered with drip irrigation. 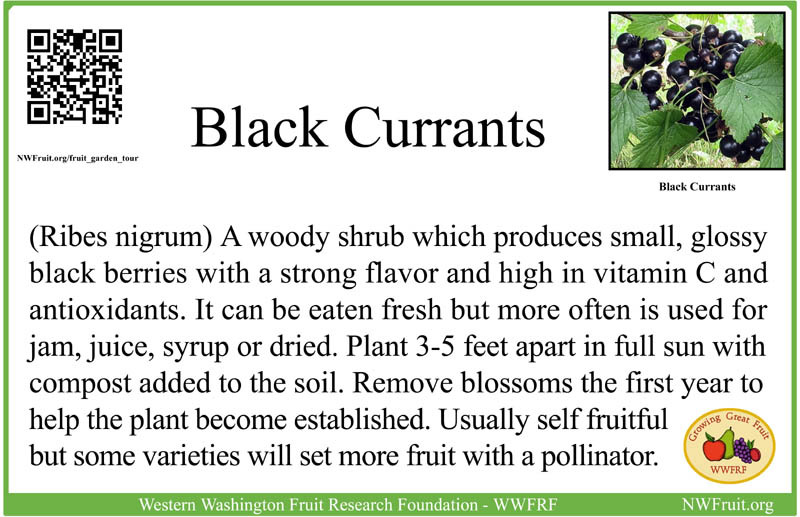 Black currants produce the best fruit on one-year-old wood. Cut branches which are older than 3 years old down to the ground in late winter leaving 10-12 strong shoots. 100 grams of black currant berries have about 180 mg of vitamin C.
Ben Lomond: The most popular commercial variety in Scotland because it is a very heavy producer with the traditional strong pungent flavor. The Ben series, named after the mountains of Scotland are among the easiest to grow and highest quality black currants in the world. This bush is compact, upright to 5 feet tall and easy to grow and prune. Best production with another variety of black currant for cross pollinization. Ripens mid-July. Ben Connan: Very productive with very large berries. Compact growth habit. Early season. Ben Nevis: A sister seedling of Ben Lomond, mid-season, large berries. Ben Alder: High yields of medium sized berries. Late blooming. Susceptible to rust. Upright habit. Fruit only hangs on the plant less than 1 week after ripening. Ben Sarek: This highly mildew and somewhat rust resistant bush is easily maintained at 3’ tall with 3’ spacing. Bears so much fruit that the branches may need support. The branches can be shaken to harvest the crop. Magnus: Late season with large fruit. Titania: A highly productive, mildew and white pine blister rust resistant cultivar. It grows quickly to 6′ tall and produces larger fruit. Mid-season. Long cropping season. Hilltop Baldwin: A heavy bearing, legendary English favorite with a sweet, black currant flavor. Highest in Vitamin C. Rated best for jelly from dozens of varieties tested at the WSU Puyallup, WA. experiment station. Partially self fertile, it produces best with another variety of black currant for cross pollinization. Minaj Smyriou: This new, self fertile introduction from Bulgaria is a heavy producer of tasty black currants on a manageable sized bush. This variety is resistant to white pine blister rust and will be the best choice in most of the nation where white pines are grown. Great for making jelly. Prince Consort: Rust resistant. Consort has a very strong flavor. It was developed in Ottawa, Canada about 1950. Want recipes? Check out The Black Currant Foundation.